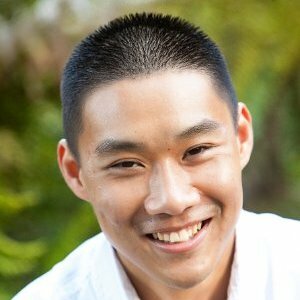 You are here: Home / Uncategorized / What is VMware vsish? Recently while I was working on testing automated ESXi kickstart installations, I needed to extract some information as part of the build process, but the utilities that were used no longer existed in ESXi's Busybox console. Looking around, I found another way to extract the information I needed, which was using VMware's undocumented vsish utility, also known as the VMkernel Sys Info Shell. There is not much information around the web regarding this vsish utility (probably for good reason), but it has been described by few as a representation of classic Service Console /proc nodes and allows the ability to extract system reliability information similar to mcelog in Linux. 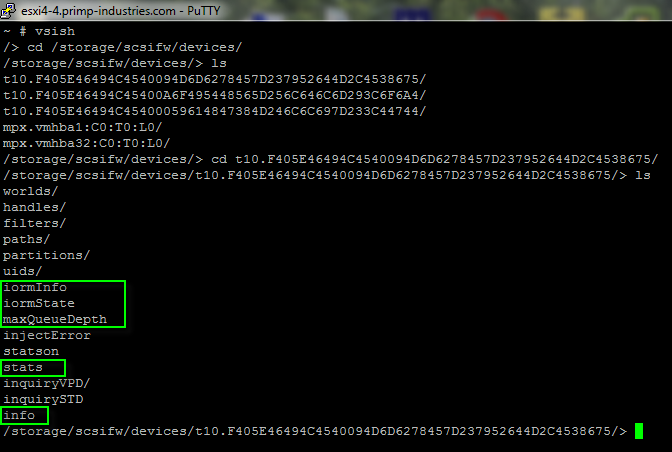 If I recall correctly, the vsish utility used to be bundled with classic ESX, but at some point it was removed. 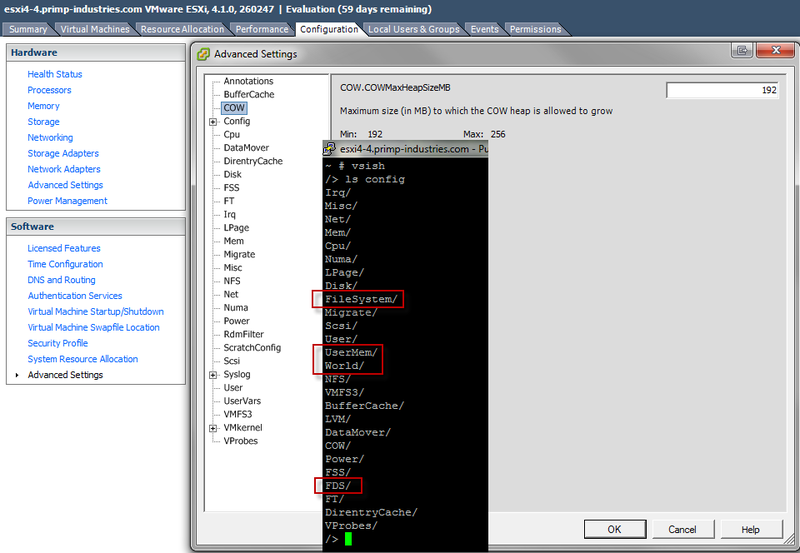 However, in ESXi, the utility is included and that is also true for latest release of ESXi 4.1. When you generate vm-support log, a dump of the vsi nodes are generally included which provides VMware support with the state of your system. 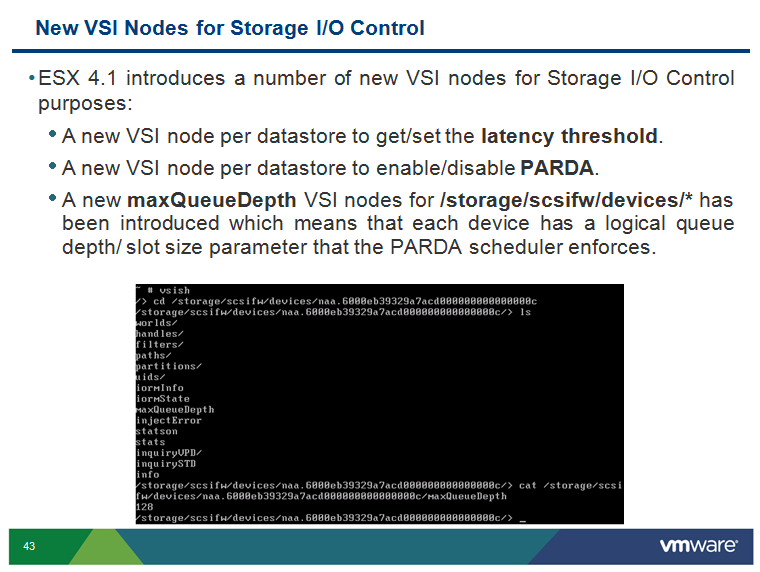 To read the vsi node dump, you need a matching version of the vsish utility based on the version of ESX or ESXi you are running. 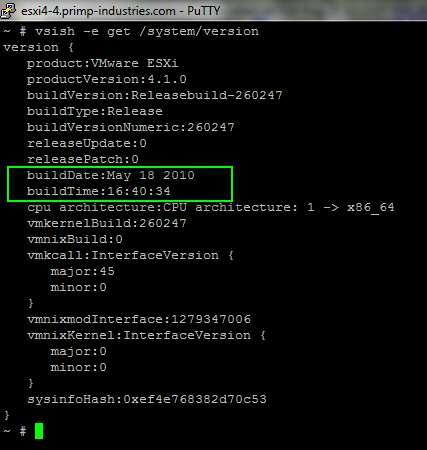 Currently for classic ESX, to obtain the vsish utility, it must be provided by VMware support via debugging package that needs to be installed. As you can see, the majority of the sub leaf nodes within "config" is exposed in the Advanced Settings, but there are some that are hidden. 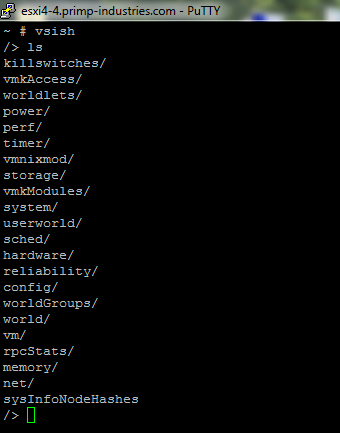 In fact, with ESX(i) 4.1, there is a total of 771 configurable options with 250 of those hidden that can only be seen using vsish (more on the configuration option later)! There are two ways to interact with vsish, you can interactively login to VSI shell and perform ls, get or set operations or perform the same operation through non-interactive mode. For more details on differences between vSphere 4.0 and vSphere 4.1 - Check out the detailed 2 part deep-dive power point presentation here. There are definitely some interesting options that can be configured and I can see why VMware would want to hide these from the general public. 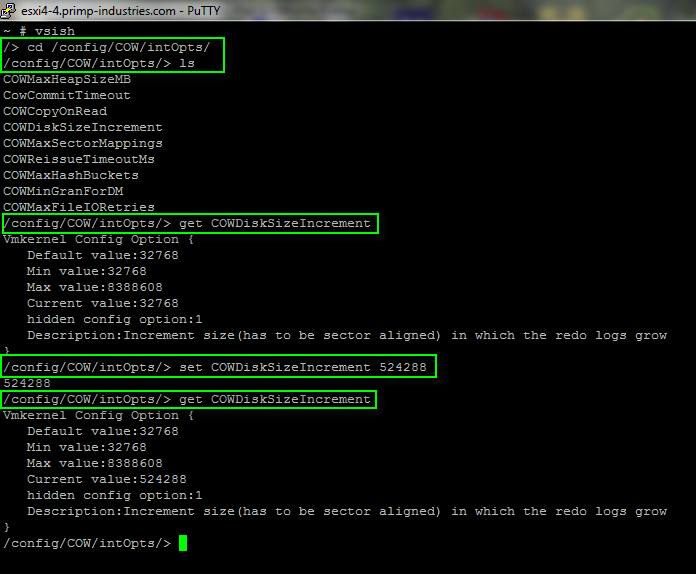 What is nice about the compiled output, is that it clearly states the path to the configuration item, the current, default, min, max, is hidden or description of the parameter. Again, use at your own risk Hopefully this these two documents will be useful for curious users to explore vsish advanced configs. Using the table above, you can actually query and modify these values using the standard esxcfg-advcfg utility that exists both on ESX(i). The following example will show you how to translate the vsish node path to proper format that is required for local esxcfg-advcfg utility. 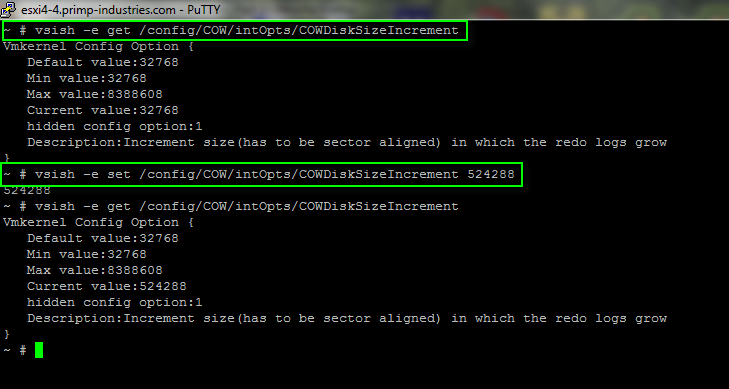 In the example, we will be using vsish path "/config/COW/intOpts/COWDiskSizeIncrement"
Note: You just need to extract the root node and the individual config leaf node in "/config/COW/intOpts/COWDiskSizeIncrement" which is highlighted in green and blue. Does SIOC actually require Enterprise Plus & vCenter Server? This is pretty amazing work William. Kudos my friend!! I imagine many people who like to roll up their sleeves will find this useful, particularly with ESX going away in the near future. Is there a way i could know the maximum memory and CPU Limits to userworld applications using vsish? is there a way i could enable auto boot after power outage from using vsish?